Théodred was the son and heir to King Théoden of Rohan, and in the book The Two Towers he is only mentioned. In Peter Jackson’s adaptation for the movie, they actually filmed some scenes of him agonizing at his father’s castle, but these scenes were cut from the theatrical release. That did not stop Toy Biz from making an action figure of him in full battle armor, although they did bother to include some hints in the figure as to the causes of his demise in the form of rents and tears at some points of his armor. 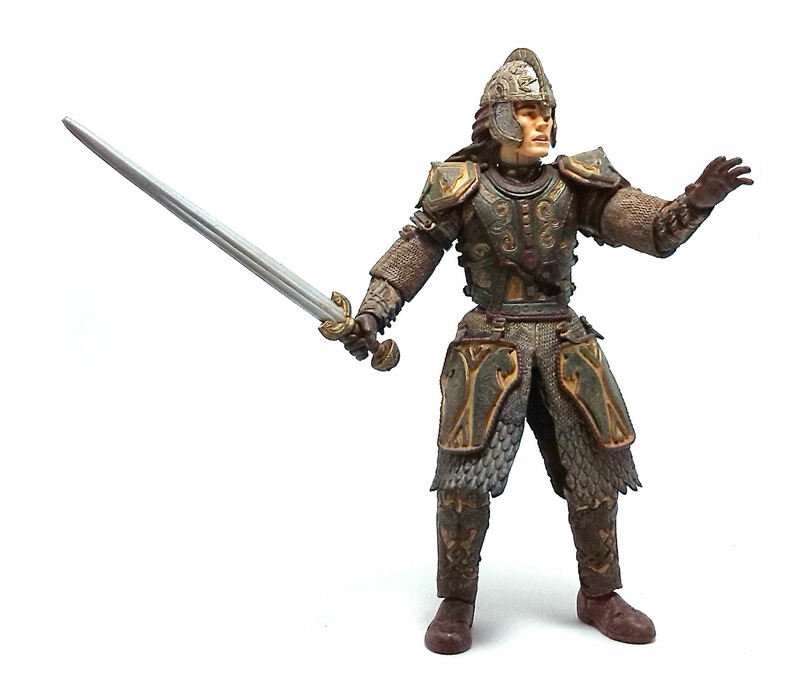 Théodred, as many of the armored figures in this line, is a very complex product. Théodred has a relatively simple basic body design underneath the leather armor, although it would actually look decent without it. The armor pieces are designed actually as separate pieces glued or attached in some other way to the figure. 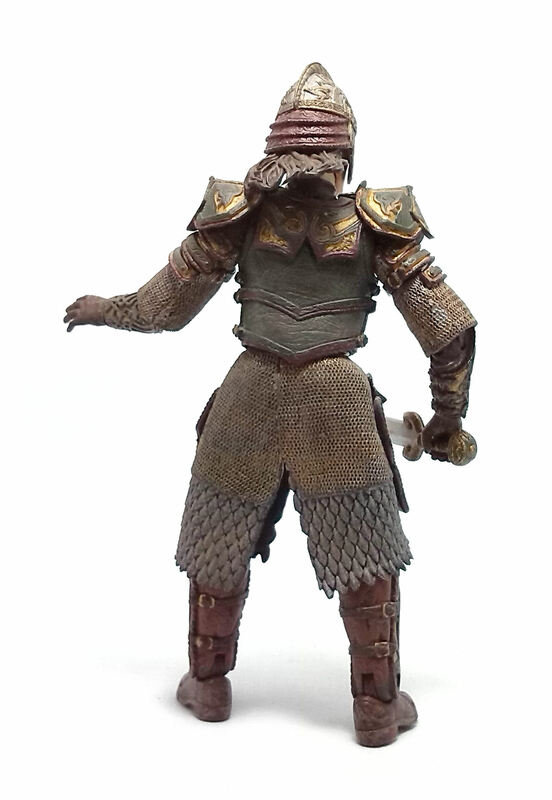 The armor is made from very pliable rubber that holds a very impressive amount of detail, from the individual scales on the mail to the ornate swirl designs from the leather armor. 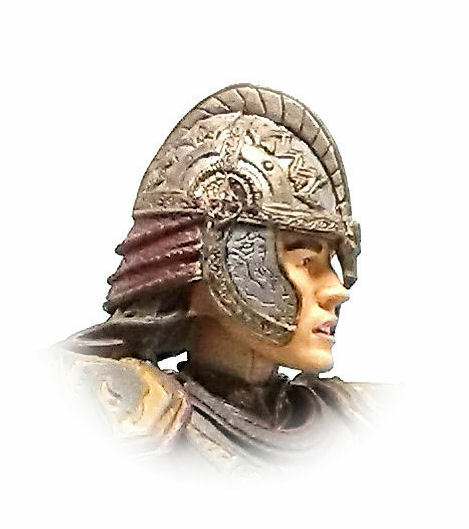 Théodred’s helmet can be removed and the face underneath looks fairly heroic, although I am not too sure if it resembles the actor who played the part. • Pin & disk neck. 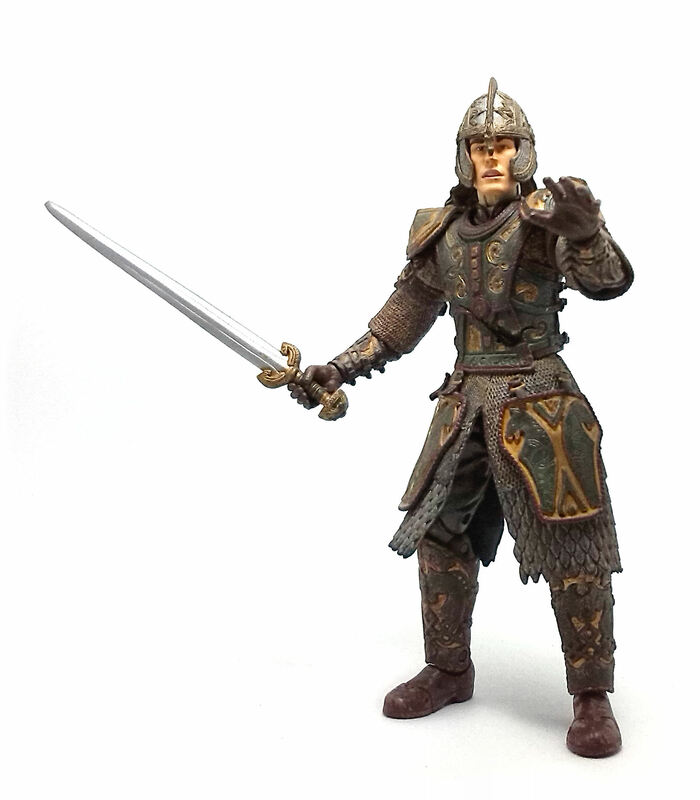 Sadly, the character design gets in the way of a lot of these articulation points limiting the overall range of movement as well as the number of poses Théodred can effectively achieve. 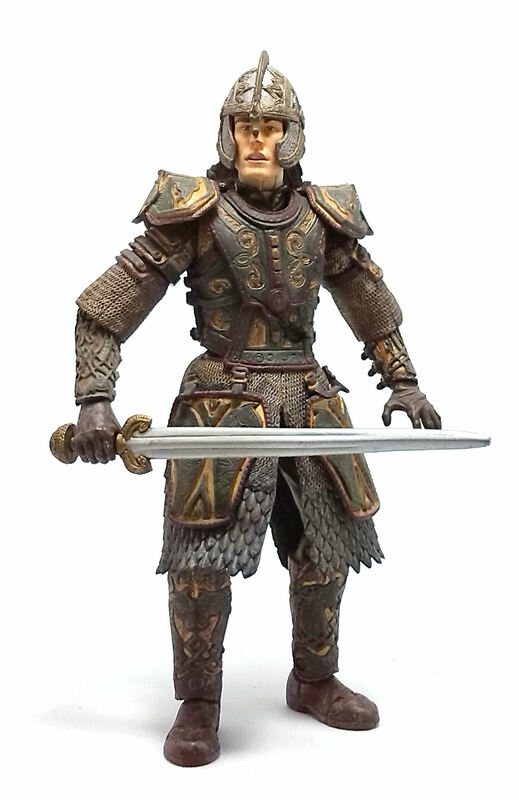 The paintjob on Théodred is actually quite good and even though there are no movie stills to compare the look of this particular outfit, it uses the same color palette the Rohirrim wear in the movie. The overall applications are precise and neat, despite the obvious weathering applied to some sections of the armor. 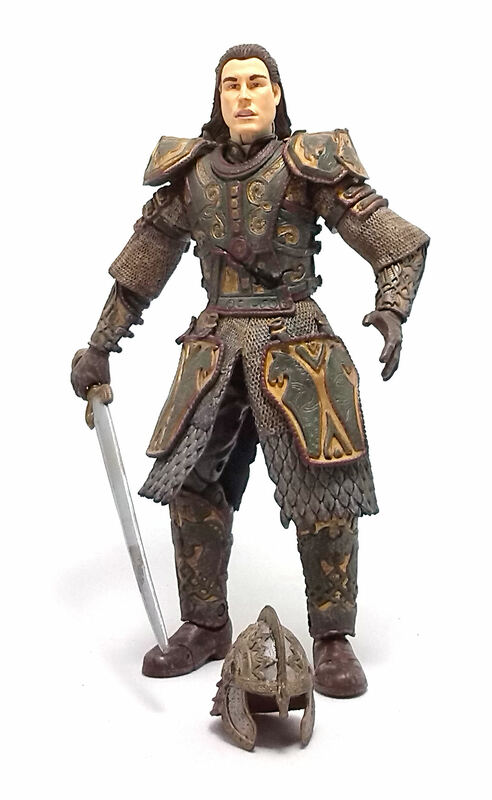 Théodred comes equipped with a very ornate helm and armed with a long sword decorated in the Rohan style, with a large pommel and a horse head design for the hilt. Both accessories are also nicely decorated to match the appearance of the rest of the gear. 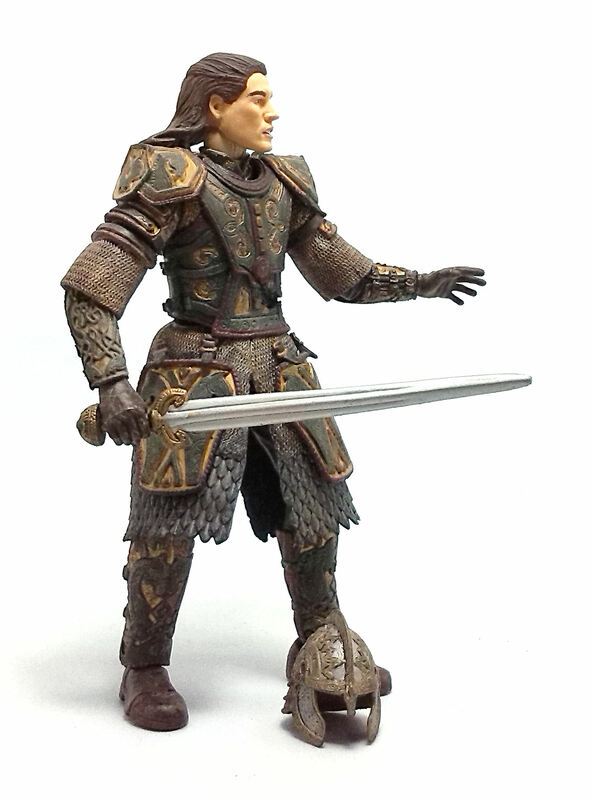 In the end, I find Théodred to be a pretty decent, generic figure to add to my Lord of the Rings shelf.